DIY - Bed Race fundraiser! When you hear a conversation about carbon fiber, too much drag and disc brakes, you might guess cars are the subject. Not so in this case. 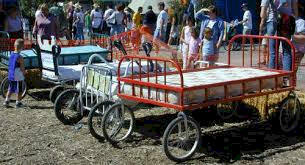 The topic at hand is what makes the best bed for the HCCI Great Topeka Bed Race. The HCCI Great Topeka Bed Race is a fundraiser for Housing and Credit Counseling Inc., a nonprofit agency that offers financial counseling, homebuyer services, tenant and landlord counseling and educational events. The race is a fun, spirited competition that is also taken quite seriously among the competitors. They were looking for a unique and fun way to let people know about HCCI when they heard about an agency in Minnesota doing this. They thought it was a good idea. And what they expected to be a cute, little event has really taken off. The audience has grown tremendously, too. The Topeka Police Department estimates about a thousand people watched the race.